Padded arms for added comfort. Comes complete with 7.5 qt. 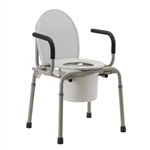 commode bucket with handle, cover and splash shield.